Full military honours were accorded to Private Samuel Chell, of the Sherwood Foresters who died of tuberculosis in Ashbourne on January 3, 1918. His funeral was reported this week in the Ashbourne Telegraph. The 28-year-old had already completed six years’ service with the regiment at the outbreak of war, but his military career was to be cruelly cut short within weeks of arriving on the front line. The son of Mr E Chell of Compton, he was sent out to France early in the conflict and was severely wounded at the first battle of the Aisne in September 1914. He was sent back to England with a shattered hand and was discharged in January 1915. The funeral at the parish church was attended by a ‘very large number’ of sympathisers. After the service, conducted by Canon Morris the procession reformed and proceeded to the cemetery where the firing party fired three volleys over the grave and a bugler sounded the Last Post. The death of Samuel Chell prompted a letter to the editor of the Ashbourne Telegraph from the town branch of the National Federation of Discharged and Demobilised Sailors and Soldiers. “This man was discharged from the army with a shattered hand; later tuberculosis developed. After being unable to work for the past 11 months, this malady carried him off. His pension at the time of his death was 3s 6d per week. Chell was not the only ‘Old Contemptible’ for whom the federation was concerned. 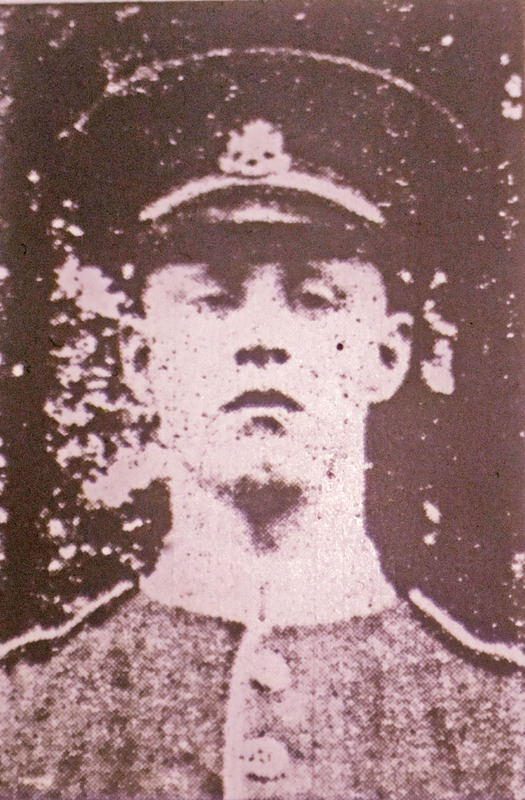 The second case raised in the letter was that of Private E Wibberley, said to have done his share for King and Country. J Tetlow, the federation correspondence secretary pointed the blame for both Chell’s and Wibberley’s financial plight at the town’s Pensions Committee. Wibberley was said to have been in receipt of just 13/6d for himself, wife and three children. Two young Ashbourne officers were mentioned in the New Year list of honours for distinguished service. Captain RE Gibson of the Royal Army Medical Corps, a former Ashbourne Grammar School pupil was mentioned in despatches and Captain AFN Henstock had been awarded the Military Cross. Henstock had joined the Welsh Fusiliers in December 1914, later earning a commission to the Sherwood Foresters and had served with the regiment in France for two years. News from the Brassington correspondent ran to just nine lines on the back page, but recorded news of no fewer than five village soldiers. “Mrs G Charlton, of Corslow’s Farm, Brassington, has received official news that that her son, Sergt. WA Charlton is missing. Mr and Mrs Wright have had news that that their son, Pte. W Wright is wounded. Lieutenant T Breakwell has been home on a week’s leave, but returned on Monday. The new year saw Ashbourne in the grip of winter and facing the severest of food shortages yet experienced. The cold blast brought heavy snow, making travelling ‘difficult and treacherous’. As a result of the shortage butchers in the town took out a notice on page two announcing that their shops would only open on Thursday, Fridays and Saturdays until further notice. The paper made a plea on behalf of the butchers, pointing out that it was not their fault as they were simply caught between the producer and customer, and had no power over government-controlled prices. But the columnist went on to suggest that farmers might be exploiting the situation. Perhaps recognising that this opinion might cause a backlash, the next item, headlined The Farmers’ Position acknowledged the importance of agriculture. While suggesting that farmers had an ‘improved financial position’ due to the war, and that ‘town dwellers’ were annoyed because strong, fit young men employed on farms were still at home while others ‘less blessed in physique’ were being sent out to fight, the writer urged restraint. This entry was posted in Uncategorized and tagged Ashbourne, Ashbourne Telegraph, First World War, Great War, National Federation of Discharged and Demobilised Sailors and Soldiers, Notts and Derby Regiment, Old Contemptible, Red Cross, shells, Sherwood Foresters, Trenches, WW1. Bookmark the permalink. Thank you for your comment. I am glad you find the blog interesting.